Man Utd and Real Madrid have fallen short of expectations this season, and that in turn has led to reports that they’re both eyeing a marquee signing this summer. 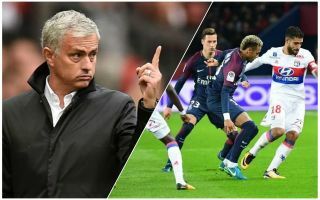 Both European giants will be hoping to land a major trophy before the end of the season, with United set for the FA Cup final while Los Blancos take on Liverpool in the Champions League final a week later. However, neither have been able to compete domestically in their respective leagues, with the Red Devils 19 points adrift of champions and rivals Man City with one game to play, while Madrid are minimally closer to Barcelona with a 15-point gap between the two. In order to bridge that gap and become a force both domestically and in Europe next season, The Mirror claim that both Man Utd and Madrid have set their sights on the £200m+ signing of Paris Saint-Germain forward Neymar. The Brazilian international has only been with the Ligue 1 champions for one season having joined from Barcelona last summer, and so they will naturally be disappointed if he wants to move on so soon after signing. He has enjoyed a stellar first campaign in France, scoring 28 goals and providing 19 assists in 30 appearances, before injury curtailed his season last month as he now faces a battle to return to full fitness with the World Cup in Russia this summer in mind too. Based on the report from the Mirror, both Man Utd and Madrid have the financial muscle to make a deal happen, but it remains to be seen which option the former Barcelona forward prefers if he is indeed seeking a fresh challenge ahead of next season. With Karim Benzema struggling for goals, Gareth Bale struggling to cement his place in Zinedine Zidane’s starting line-up on a regular basis and with Cristiano Ronaldo set to turn 34 next year, Madrid’s need for Neymar is evident. As for Jose Mourinho and United, he already has the likes of Alexis Sanchez, Anthony Martial, Marcus Rashford, Juan Mata and Jesse Lingard at his disposal to play behind main striker R0melu Lukaku, but there’s no denying that Neymar is a level above those and would add real quality to the side.